As far as Microsoft Access is concerned compacting the Database is an essential function to keep the Database size to the minimum. When you work with the Database MS-Access creates temporary work-objects within the Database resulting the file size to expand. We can display some of these temporary objects with VBA Code. Copy and paste the following Code into the Global Module of a Database that was not compacted recently. Press Ctrl+G to open the Debug Window (Immediate Window), click somewhere within the code and press F5 to execute it. After compacting the Database if you run this code again then these type of objects will not appear at all. If the Database is a Single User one then there isn't much to worry about this issue, because all you have to do is to enable the Compacting on Close feature in the Options settings. Select the Menu Tools - -> Options - - > General Tab and put a check mark in the Compact on Close option. Every time MS-Access will compact the Database when you close it. But, if the Database is Shared on Network then enabling this feature can lead to problems. You should have Exclusive Access of the Database to run compacting. When you turn on the Compact on Close feature it will attempt to do that but will fail if others are using it. We don't know what will be the impact of these repeated attempts and failures, from different sharing points, on the Database. Enabling the Exclusive Access Option (Tools - -> Security - -> User and Group Permissions - -> Permissions Tab) will not allow concurrent sharing. Select Tools - -> Database Utilities - - > Compact and Repair Database. Closes the Current Database. Creates a temporary Database with the name db1.mdb in the current folder. Transfers all the Objects (Tables, Forms, Reports etc. ), except the work-objects, into db1.mdb. Renames db1.mdb file to the original name. Re-opens the newly created Database. 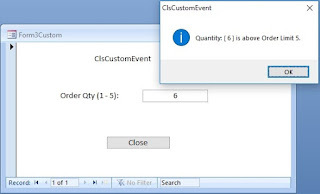 If a database is not active when you select the option in Step-1 you are asked to select the Source Database from disk and will prompt for a Target Name to save the compacted copy in your preferred location. It will not re-create it with the original name. It is up to you to decide what to do with the old and new files. To do compacting on Server, User-level Disk Quota Allocation is also a matter of concern. The User should have double the size of the Database or more free disk space available under his allocated Disk Quota. In these circumstances a separate Compacting Utility Program is useful when you have several Databases shared on Network. We are going to create such a Database with VBA Programs that can compact one or more Databases easily. The Program follows the same route map described in Step-1 to 7 above but with some change in the way the procedure is Run. Uses Local Disk Space for Work-File, which will speed up the process, and extra space on server is not required for this purpose. Can select more than one Database for compacting. Takes a safe Backup on Local Drive besides compacting. No failures due to non-availability of enough Disk Space under the User's Disk Quota. We will create a small Database with a Table to hold a list of Database Path Names, a Form and two VBA Programs on the Form Module. Create a new Database with the name CompUtil.mdb. Create a Table with the following structure. Save the Table with the name FilesList and key-in the full path names of your Databases running on Server and close the table. Do not use UNC ("\\ServerName\FolderName\DatabaseNname") type addressing method. Open a new Form and create a List Box using the FilesList Table. See the design given below. Draw two Label Controls below the List Box and two Command Buttons below that, side by side. Re-size the Controls and position them, to look almost like the design given above. The finished design in Normal View is given below. The Labels below the List Box are kept hidden and will appear only when we run the Program. Change the Property Values of the Form and Controls so that you can make them look exactly like the design given above. Click on the List Box and display the property sheet (View - - > Properties). Re-size the child Label Control, attached to the List Box, to the same size and position it above the List Box. Change the Caption to Database List. Create a Header Label at the top with the Caption Compacting Utility and change the Font Size to 18 Points or to a size to your liking. NB: If you would like to create a Heading with 3D style characters, like the sample shown above, visit the Page Create 3D Heading on Forms and follow the procedure explained there. This you can do it later also. Select the Rectangle Tool from the Toolbox and draw a Rectangle around the Controls as shown on the Design. Display the VBA Module of the Form (View - - > Code), Copy and Paste the following Code into it and save the Form with the name Compacting. ldbName = ldbName & "ldb" 'for checking the presense of lock file. MsgBox "Database : " & dbname & vbCrLf & "is active. Skipping to the Next in list." Me.lblstat.Caption = "Working, Please wait..."
Const tmp As String = "c:\tmp\"
Me.lblMsg.Caption = "Transferring Objects from " & strdb & vbCrLf _& "to " & tmp & "db1"
DBEngine.CompactDatabase strdb, tmp & "db1.mdb"
lblMsg.Caption = "Creating " & strdb & " from " & tmp & "db1.mdb"
You can set the Compacting Form to open at Startup. Select Startup from Tools Menu. Select the Form Compacting in the Display Form/Page Control. If you want to hide the Database Window then remove the check mark from Display Database Window Option. Open the Compacting Form in Normal view. Select one or more Databases from the List Box for Compacting. Click the Repair/Compact Command Button. If you are running the Program for the first time it will check for the presence of a Folder c:\tmp. If it is not there then it will be created. This folder will be used as Work-Area for the Compacting Utility irrespective of from where you are running this Program (from Server or from Local Drive) and places the Backup Copies of the Compacted Databases. The program runs a check on each selected database before running the Compacting Procedure to re-confirm that nobody is using it. If it does then it will display a message as such and will not Compact that Database. The Label Controls that we have created and kept hidden below the List Box will be visible now. It will be updated with the program's current activity information, at different stages of the Compacting Procedure. Any suggestions for improvement of this Program are welcome. This database works beautifully for compacting all our facility's databases out of one source, but is there any way a field for the last date a successful compact/repair is run could be added? It would be nice to be able to keep track of when a DB has been compacted so I can set up a schedule for some of the larger and more often used systems. Yes, it is possible. You can add a Date Field to the Table to update the last Compacted date at the end of the compacting routine, by using the Record sequence number as key. You need to modify the Code.